Since it was first released in July 2006, Prosci's PCT Model has helped countless project teams and change management professionals become more effective by understanding and improving performance in each corner of the triangle. If a project is missing any of the three components, it will struggle or fail. Without leadership and direction, a project will struggle to remain a priority and can be lost in the confusion of the other work going on in the organization. Without a solid approach for the technical side, a project may not arrive at the necessary solution. Without a solid approach for the people side, an effective technical solution may not be embraced and utilized fully or effectively by employees. 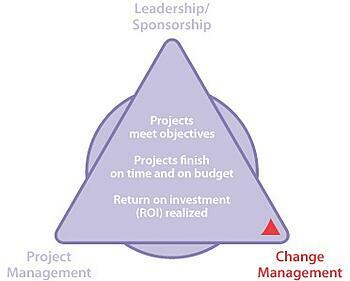 All three elements are necessary when an organization launches a project or initiative. Below are more complete definitions of each of the three components of the Prosci PCT Model. The top corner of the PCT Model is Leadership/Sponsorship. This corner is responsible for providing the direction and governance for the project or initiative. The project team, change management team, managers, supervisors and employees all look to leadership in the organization to understand why a change is happening, how it aligns with the direction of the organization and why it is a priority. 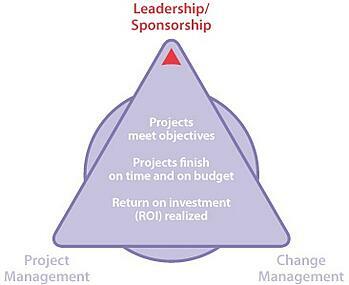 Leadership and sponsorship play a key role in authorizing and legitimizing a change. From a logistical standpoint, this includes providing the resources and funding necessary for a project or initiative. However, individuals in the organization will also look to this role to evaluate the commitment to the change. Employees need to know that the organization is committed to making the change happen. They also want to see a personal commitment from leaders to validate investing the time and energy to make a change. In terms of the model, the leadership/sponsorship corner plays a role at two levels: the organizational level and the project level. At the organizational level, leaders are responsible for creating the vision and strategy for where the organization is heading. At a project level, leaders must show how the particular project or initiative aligns with and supports the direction of the organization. 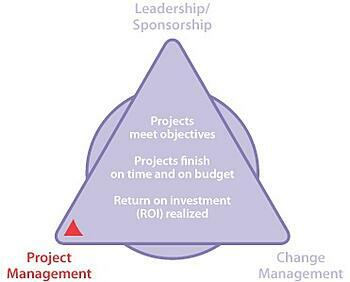 The left corner of the PCT Model is project management. 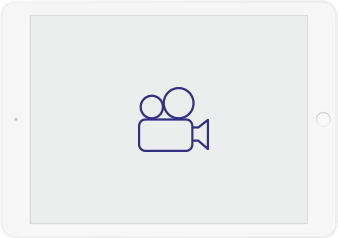 This corner is focused on the technical side of a project or initiative, such as designing and developing the specific changes to processes, systems, tools, organizational structures and job roles. The first aspect of this corner is to fully define the change by going beyond a simple vision or goal to a real, concrete definition of what specific changes will be occurring. Establishing scope and objectives are also important activities that occur in the project management corner of the model. In addition to the complete and clear definition, this corner of the PCT Model includes what you might be more familiar with in terms of project management: managing the tradeoff between the time, scope and cost of the project or initiative. The Project management corner of the PCT Model includes the management of the resources, tasks and activities that are part of the technical side of the project or initiative. Schedules, milestones, work breakdown structures and the many other tools used by project managers fall into this corner, in addition to the assignment of a project manager and the acquisition of the resources necessary to design and develop the solution. The bottom right corner of the Prosci PCT Model is change management: the application of the tools, processes, techniques and principles for managing the people side of the project or initiative to achieve a desired outcome. While the project management corner is focused on the tasks related to designing and developing a solution, the change management corner focuses on how to encourage employees to embrace and adopt that solution. This corner is often what is missing when a project is implemented and meets technical requirements but does not deliver the ultimate value to the organization. The tools, processes, techniques and principles that make up change management are aimed at helping each impacted employee move from their own personal current state to their own personal future state. It is individuals changing how they do work that ultimately results in a project or initiative delivering value to the organization. There are many characteristics of the individual current state and individual future state that can impede or inhibit successful change. The change management corner of the PCT Model provides a systematic approach to addressing these issues. The individual perspective answers the question: How does one person make a change successfully? Prosci's ADKAR Model describes the five building blocks of successful individual change: awareness, desire, knowledge, ability and reinforcement (read more about ADKAR). The organizational perspective answers the question: What do change management practitioners do to support individual change? Prosci's 3-Phase Process includes specific activities for preparing for change, managing change and reinforcing change (read more about the 3-Phase Process). The Prosci PCT Model establishes a framework and context for what you need in order to succeed at change within the organization. 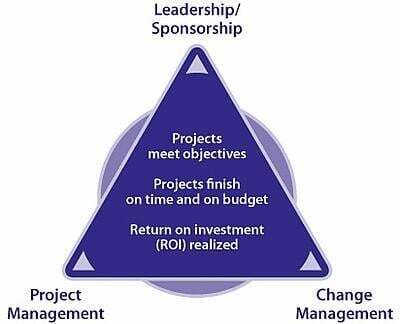 Prosci PCT Model is a simple but powerful framework for the three elements of successful change: leadership/sponsorship, project management and change management.In this webinar you will learn how to assess the health of your project, identify root causes of problems, and create action steps to realize the desired results and outcomes of change.